Home / hotels / restaurants / Peruvian Ceviche anyone? 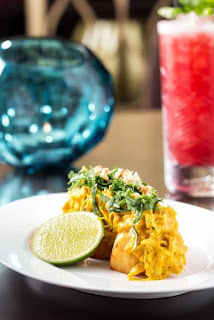 Did you see the title of this post and wonder what Peruvian Ceviche is? I only ask because I had no idea what it was. I'm still not 100% clear on what it is but I understand that it's essentially super-fresh in-season food only. The dishes are also prepared raw (well, at least without any heat) which I guess is where the need for really fresh food comes in. Here's a link to the Wikipedia definition. So, my dumbed down explanation for Peruvian Ceviche is: It's basically Latin American Sushi. with side dishes and stuff. Now I don't know about you, but I love Sushi, so I am now interested in this Peruvian Ceviche event that is taking place at the JBB (John Barry Bar) from the 11th to the 19th of February. For those of you reading this that are going to the Back 2 Business event on the 9th of February, Chef Bruno (who as you may have guessed it, is from Peru) who is flying in from the Hyatt Regency in Istanbul will be offering samples of his cuisine there as well. Right, so there is Peruvian sushi Ceviche available at the John Barry Bar each day between the 11th and 19th of February for those of you who'd like to check it out. I'm told the food goes very well with cocktails, and I certainly enjoy cocktails so this should work out nicely for me.